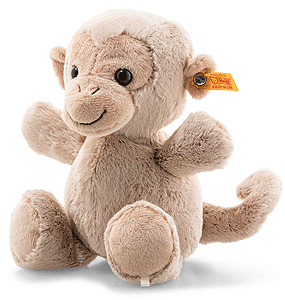 Koko Monkey is hand made in the finest light brown cuddly soft plush. Here comes Soft Cuddly Friends Koko, the 22 cm tall monkey. This ideal cuddly toy made of the finest soft and cuddly plush material is light brown and has embroidered brown nostrils with a smiling embroidered mouth. The black eyes add some sparkle to his little face, which is rich in contrast. As is fitting for a little monkey, he has a cute, soft curly tail.